The Nidahas Trophy is becoming more interesting match after match. What a terrific chase it was? Bangladesh proved that they are still there in the tournament to prove their ability. All three teams have won one match in the tournament. It will be interesting to see who wins the 4th T20. In this post we will throw light on Today Dream11 Fantasy Cricket Prediction| IND V SL 4th T20, crix11 will provide you a detailed report on players recent and past performance, pitch report, likely playing 11, who will win the match, what astrology has to say about the toss and many more. Who Will Win the 4th T20, IND v SL? 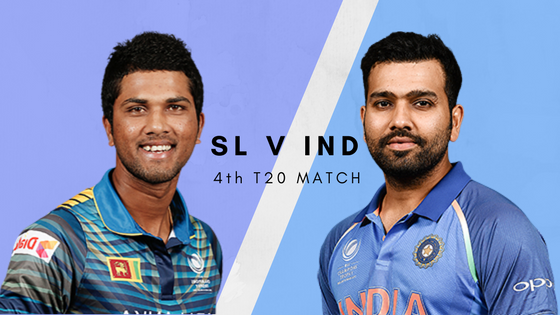 Match: India and Bangladesh in Sri Lanka T20 Tri-series,2018, IND v SL. Average second inning score is 136. The first game played here was more of a slow side but in the last match, it was a batting beauty. It is expected that the match will be played in the same pitch where India and Sri Lanka played there last game. So the pitch will be slow and it will support the spinners. India has won four matches out of five in the last 5 matches. The last match they played against each other was in the Nidahas trophy, where Sri Lanka chased 175 proving that no one is favorite in this tournament. The temperature is expected to be hot and humid with a maximum temperature of 30-degree Celsius. In the afternoon it is predicted that there will be thunderstorms and there is 60% chance of rain but the rain will not affect the game. Shikhar Dhawan, Suresh Raina, Rohit Sharma (c), Mohammed Siraj, Dinesh Karthik (wk), Jaydev Unadkat, Lokesh Rahul, Axar Patel, Yuzvendra Chahal, Manish Pandey, Shardul Thakur, Washington Sundar, Rishabh Pant, Vijay Shankar, Deepak Hooda. Kusal Mendis, Danushka Gunathilaka, Isuru Udana, Jeevan Mendis, Akila Dananjaya, Kusal Perera, Dhananjaya de Silva, Upul Tharanga, Dinesh Chandimal (c & wk), Thisara Perera, Dasun Shanaka, Dushmantha Chameera, Suranga Lakmal, Nuwan Pradeep, Amila Aponso. Seeing the rusty form of Rishabh Pant India may play with a couple of changes, Hooda or KL Rahul may get chance in place of Pant else India will play with the same team as winning the game is their first priority. After a nightmare in the last game, Sri Lanka may give chance to Suranga Lakmal in place of Dushmantha Chameera or Nuwan Pradeep. Their top order batsman is performing quite well so they will not disturb that order. Chandimal will not play as he was banned for slow over rate. Kusal Mendis, Danushka Gunathilaka, Jeevan Mendis, Kusal Perera, Upul Tharanga, Thisara Perera, Dasun Shanaka, Akila Dananjaya, Suranga Lakmal, Nuwan Pradeep, Dhananjaya de Silva. Dinesh Karthik: In the last match Karthik scored 2 runs in 2 balls and contributed 11 points. 57.5% of the dream11 fantasy users have selected him. Pro Tips: We have to select Karthik only as Chandimal will not play the 4th T20. Shikhar Dhawan: Dhawan has scored 55 runs in 43 balls and contributed 38 points. He is in best form. 79.83% of the users have selected him. Suresh Raina: Raina has scored 28 runs in the last innings and contributed 25.5 points. 66.76% of the users have taken him. Rohit Sharma: Something is better than nothing. Yes, Rohit has scored few runs in the last match. He scored 17 runs in the last inning and contributed 12 points. 54.77% of the users have chosen him in their team. Kusal Mendis: Mendis has scored 57 runs off 30 balls in the last inning and contributed 44.5 fantasy points. 61.52% of the users have selected him in their dream11 team. Danushka Gunathilaka: Gunathilaka has scored 26 runs off 17 balls in the last inning and contributed 15.5 points. 42.81% of the users have selected him in their team. Kusal Perera: Perera is in tremendous form. He has scored 4 fifties in last 7 innings. In the last inning, he has scored 74 runs off 48 balls and contributed 49 points. 78.87% of the users have taken him in their team. Pro Tips: Try to keep Perera, Mendis, Dhawan, Raina, and Rohit in your team. For multiple teams make a combination from the above list. Vijay Shankar: Vijay took 2 wickets in his four overs in the last inning and contributed 22 points. 53.58% of the fantasy users have selected him. Washington Sundar: Sundar didn’t take any wicket in the last inning but he was very economical. He has contributed 3 points in the last match. 43.3% of the users have selected him in their dream team. Thisara Perera: Thisara failed to score runs in the last match but he took 1 wicket and contributed 19 points. 61.14% of the users have selected him. Pro Tips: Try to keep Sundar on your team because the pitch will be slow and his performance is going to be handy. If you are playing with multiple teams make a combination from the above list. Yuzvendra Chahal: Chahal took 1 wicket in the last match and contributed 18 points. 75.67% of the users have selected him. Jaydev Unadkat: Unadkat took 3 wickets in the last inning and contributed 35 points. 84.33% of the users have selected him. Pro Tips: Try to keep Chahal and Unadkat on your team. For multiple teams, you can keep bowlers from the playing 11. Last matches results suggest that India will win the match. On paper both the teams are similar. Our experts predicted that India will win the game and according to our astrology team Men in Blue will win the game. India will win the toss and Rohit Sharma will decide to bowl first as dew will be an important factor. Our Astrology expert says that Sri Lanka will win the toss and they will also decide to bowl first. Conclusion: For Today Dream11 Fantasy Cricket Prediction| IND V SL 4th T20, we have this much to say. If we find any changes in the team we will update in our social media channels and of course on our website. Feel free to give our valuable feedback and suggestions in the comment box. GOODBYE! Hang On Full Match Analysis and details coming soon!!! Sri Lanka Probable Playing 11 k badle Bangladesh Probable Playing 11 da diya. Thanks for making the correction. Now the correct team has been published.